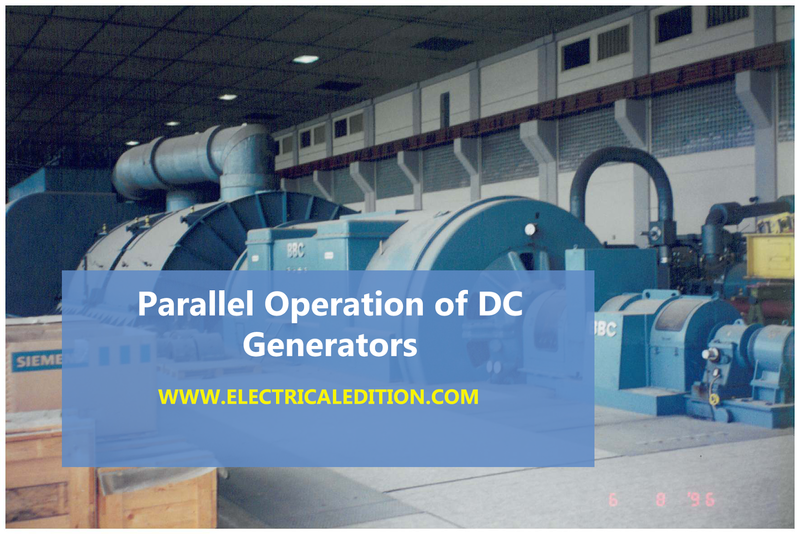 In this tutorial we going to discuss about parallel operation of DC generators.We mostly do not go for parallel operation for DC series generators ,but in some cases like electrical braking we go for it.Before going to deep discussion on why? parallel operation of DC generators is needed. In latest power generating system, power is usually supplied by many generators connected in parallel because due to lots of advantages. 1. Reliability.The sources of power such as generators are frequently primary safety items and are therefore duplicated or paralleled for reliability. 2. Continuity of power supply. If you are running only single generator,in case of breakdown the supply of power will get disrupted.So to avoid this problem we operate dc generators in parallel. 3. To improve efficiency of dc generators. Electrical machines run most efficiently when loaded on their rated capacity. DC generators also runs most efficiently at rated capacity and moreover power costs less per kWh when the generator producing it is efficiently loaded.In parallel operation of dc generators we have one more advantage that we can shutdown/start generator units as per power requirements. 4. Easy to maintain and repair of DC generators. Generators requires regular-maintenance and repair as like every machine. In case of parallel operation of dc generators the routine or emergency operations can be performed by isolating the only affected dc generator while load is being supplied by other units. This leads to both safety and economy. 5. Non-availability of single required large generator. It is hard to get single rated generator if concern efficiency and cost.So it is better to operate small generators in parallel in order to get desired power. 6. To increasing plant capacity. In the modern world of increasing population, the use of electricity is continuously increasing. To increase power capacity as it changes,we have flexibility in parallel operation that is,we can add a new unit in parallel with the old units. 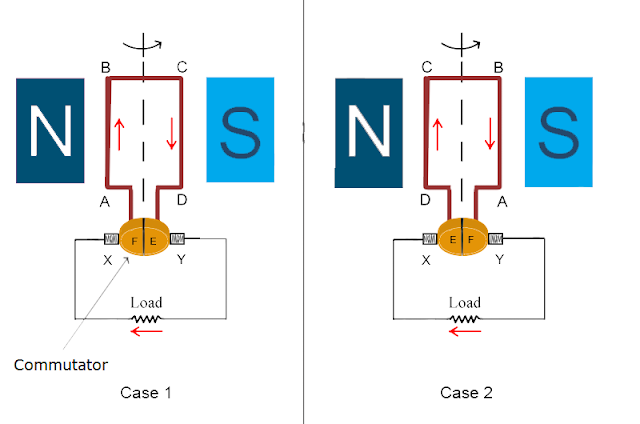 particular load as per its capacity; that is why the switch SI and the circuit breaker CB, are shown closed in figure. When the load on the station increases beyond the capacity of generator A. it is essential to connect the generator B to operate in parallel with A. in order to share the total load on the station. The procedure for paralleling generator B with generator A comprises following steps. (i) The prime mover of the generator B is brought up to the rated speed. (ii) Switch S4 provided in the generator field circuit is closed, as a result the generator will build up its voltage. (iii) The circuit breaker CB2 is closed. 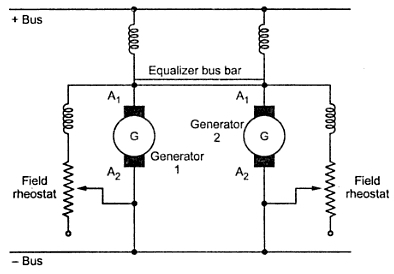 (v) Polarities of the generator B should be the same as those of the bus bars. (vi) Now the main switch S2 is closed. thus putting generator B in parallel with generator A. However generator B is still running idle or floating (not supplying any load). (vii) Adjust the field rheostats of generators A and B simultaneously. The field current of generators A should be reduced slowly. while that of generator B be increased. By this process. any amount of load can be shifted on to generator B. However. care should be taken that the incoming machine is not overload. (viii) In case generator A is to be shut down. the whole load can be shifted onto generator B, provided it has a capacity to supply that load without over- loading. In that case reduce the current in the generator A to zero and then open switch S1. Next the load sharing by the two generators running in parallel is discussed. Let us assume the following for the derivation of the equations showing the load sharing. The external characteristic of the two generators can now be expressed as. Above equations clearly indicate that the current supplied by each generator consists of two components (i) independent of load current (ii) dependent upon load current. First component exists when the generated emfs of two generators running in parallel are different, which certainly causes the circulating current to flow producing heat loss. This component would exist even at no load and can be avoided only when the emfs generated by the two generators are equal. Second component shows clearly that the load current divides itself inversely as the armature resistance of the generators. Based on above equations which are obtained by parallel operation of shunt generators we get load shared by each generator operating In parallel can be ascertained depending upon the parameters of the generators. Above we discussed why parallel operation of dc generators is necessary ?.Here we are going to discuss about parallel operation of D.C. compound generators. Let us have two compound dc generators,say generator 1 and generator 2 running in parallel as shown in the below figure.Assume each generator is taking proper share of load. Due to some reason,say the generator 1 taking more load slightly then the current passing through its series field winding increases strengthening its field to increase the generated e.m.f. This causes generator 1 to take still more load. If system load is assumed to be constant then the load on generator 2 will decrease weakening its series field due to less current passing through its field winding which results in further decrease in its load. This effect is cumulative which leads generator 1 to take the entire load and generator 2 will be driven as motor. The circuit breakers of at least one of the two generators will open to stop the parallel operation. The under compound generators show stable operation like shunt generators. For stable parallel operation of over and level compound generators, equalizer bus bars are used. It is connected to the armature ends of the series coils of the generators. The equalizer bus bar is also a conductor which is not required is case of under compound generator as their characteristics are not rising. Now consider that the same two compound generators are operating in parallel with equalizer bar between them. If for any reason, generator 1 starts taking more load than its proper share the its series field current is increased. But now this increased field current will partly pass through series field winding of generator 1 and partly through series field winding of generator 2 via equalizer bar. Thus the two generators are affected in similar way preventing generator 1 from taking extra load. To have proper division of load from no load to full load it is required that the regulation of each generator must be same. The series field resistances should be inversely proportional to the generator ratings. DC generators have vast area of applications and the choice of a DC generator for a particular service depends upon its performance characteristics. 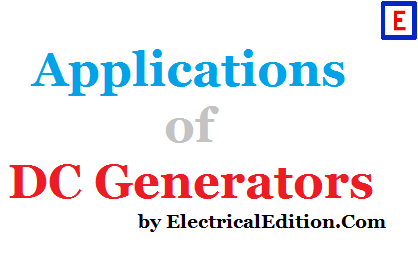 The applications of various DC generators are given as follows. Though being expensive, separately excited generators find their applications where self excited generators would be relatively unsatisfactory. They are used where quick and definite response to control is important since quicker. and more precise response to the changes in the resistance of the field circuit is obtained by separate excitation. (a) They are used in Ward-Leonard system of speed control to serve as a control generator. (b) Used in power-generating station to serve as an excitation source for large alternators. (c) Used to serve as auxiliary and emergency power supplies. Series wound D.C generators are used in D.C locomotives for the purpose of supplying field current for regenerative braking. This type of generators also find use in series arc lighting. The most important use of series wound D.C generators is as series booster. The drooping portion of the V-I characteristics enables them to be employed as a constant current source. The property of shunt wound D.C generators to give constant output voltage makes their use in charging of batteries and also for light and power supply purpose. The property of over-compounded type D.C generators to maintain constant voltage at the consumer terminals makes its use for lighting and power services. Differential compound wound D.C generators which are referred as constant current generator finds an useful application as an arc welding generator. Here we going to deduce an equation for DC generator output voltage.DC Generator EMF Equation explained in easy way below. N = speed of armature in r.p.m. Eg = EMF induced in any parallel path of armature. As per Faraday’s law of electromagnetic induction. Armature revolves 60/N times one second. Therefore the time required by it for one revolution is dt. Tags:e.m.f. equation of generator pdf,e.m.f. equation of generator derivation,e.m.f. equation of generator easy way ,emf of dc generator. The commutator is a split ring of larger size with large number of splits (commutator segments). It is called a mechanical, rectifier in generator and an inverter in motor. 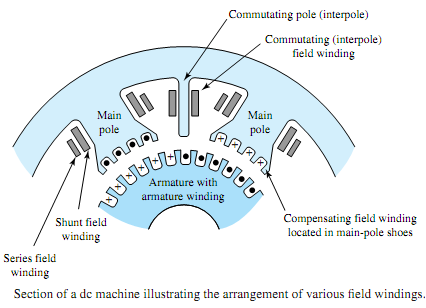 The connections to the commutator depends upon the type of armature windings. These are made of hard copper so as to withstand the brush forces which are placed upon the commutator segments. The position of the brushes is generally based on the winding. Commutator consists of number of segments or bars insulated from each other and are combined together tightly to form a cylinder as shown in figure, and fitted on the insulated Shaft of the armature. This is known as commutator. To insulate the segments of commutator thin layers of (0.5 to 1 mm) mica is used. The ends of the coils wound on the armature are soldered on the segment of commutator. The insulating mica sheet is usually M or V shaped so as to prevent the segments from flying out due to centrifugal forces. 1. As the voltage build up in the armature conductors is A.C form, to convert it into D.C voltage commutator is used in the external circuit in generator operation, whereas in D.C motor it produces unidirectional torque. 2. It facilitates the collection of current from armature. 3. It helps in connecting the armature with the external circuit. 4. It converts alternating quantity into a direct quantity. (i.e., voltage or current) and vice—versa. 5. It keeps rotor or armature M.M.F stationary in space even though the armature is rotating. The induced e.m.f in the armature conductors of a DC generator can be made unidirectional with the help of commutator or slip rings and brushes. 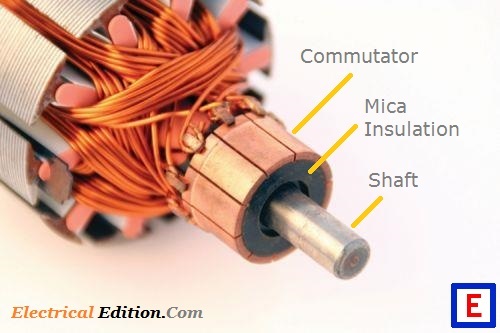 What is the function of a commutator? The function of commutator is to collect alternating current induced in armature conductor and convert it into unidirectional current. Constructionally it is cylindrical in shape built with hard drawn high conductivity copper segments. In figure two segments E and F are shown. They are separated by a thin layer of mica insulation usually of V—shape. Two brushes X and Y are mounted on the segments. In figure (Case 1) the first half rotation i.e., from 0 to 180° the coil position, with the segments are shown. 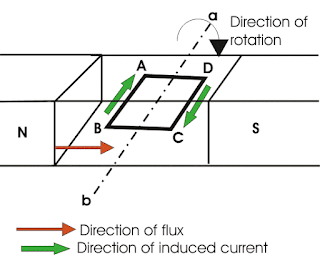 The direction of current flow is from point A to B. 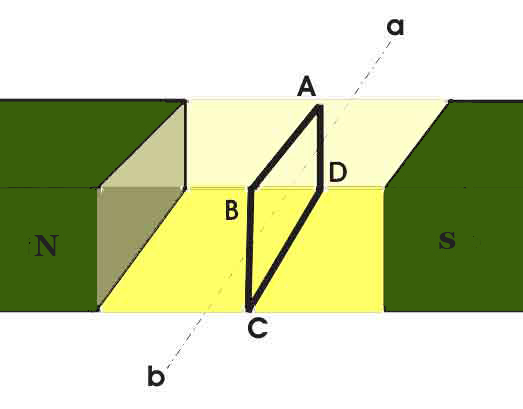 In the next half rotation as in figure (Case 2) the segments are interchanged. Thus, the direction of current in this case is from B to A, similarly though the segments. i.e., 0 to 180°. is from A to B and 180 to 360° is from B to A. By considering the total revolution 0 to 180° is taken as positive and 180 to 360° as negative. This current is passed through the load resistance R in the external circuit and develops the unidirectional or DC voltage. 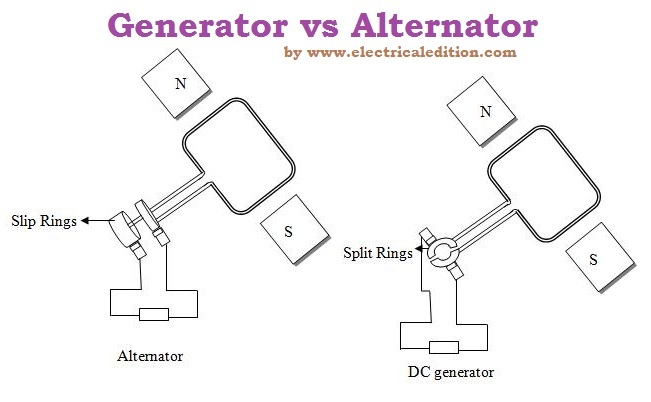 Generator is a machine which produces EMF dynamically from a mechanical input.In other words it is a machine which converts mechanical energy to electrical energy.DC generator is nothing but which gives DC output voltage.Working principle DC generator is very simple. Whenever conductors cuts the magnetic flux (φ) EMF induces,the amount of EMF is directly proportional to rate of change of flux linkages. 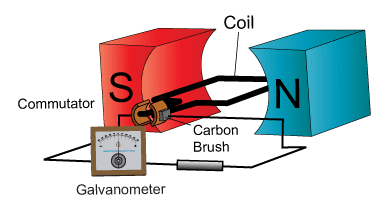 The above equation of faraday's law is the fundamental working principle of generator,Synchronous generator..etc.A DC generator produces direct power,AC generator produces alternating power. To get better idea on working of generator you need to know about simple loop generator.Let us consider a simple loop DC generator as shown in the figure with one turn coil and one pair of magnet to produce magnetic flux. So to get rate of change in flux (φ) linkages either conductors or magnetic field should be in motion.So for our convenience assume magnets are stationary and coil is rotating with the help of any mechanical input.now consider the arrangement as below without any input it is in stationary position. 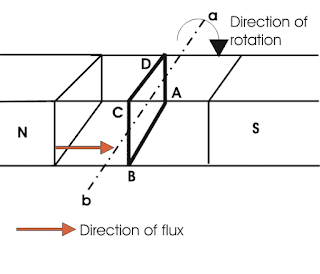 As during this movement AB and CD sides of the coil cut the flux lines there will be an EMF induced in these both of the sides (AB & BC) of the loop by faraday's law,Maximum flux is linked in this position because AB and CD are parallel to magnetic filed direction.field strength at AB & CD are not same so dφ exist.As the closed path exists in the coil current flows in the coil.Current direction can be found by flemming's right hand rule. 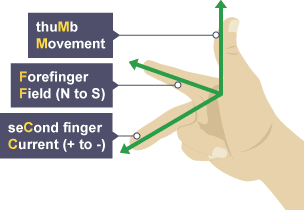 By flemming's right hand rule current flow we find current direction as from A to B ,C to D.
Now coil is rotated to next right angled position, AB and CD are perpendicular to magnetic filed direction.Magnetic field strength at AB & CD are same.So difference between the field strength is zero i.e., dφ almost zero.hence induced emf,current also zero. 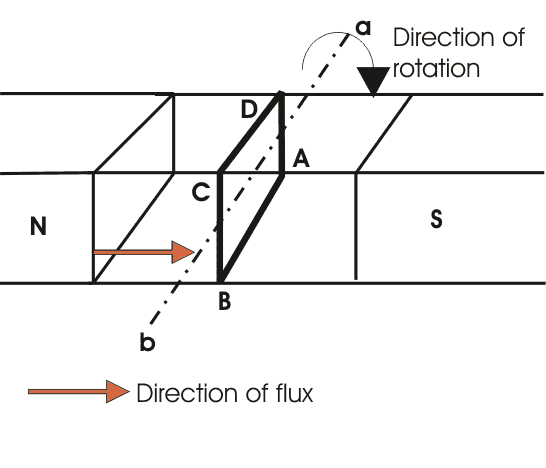 Now coil is rotated to next right angled position, AB and CD are parallel to magnetic filed direction.So maximum amount of EMF will induce[Like Step-1].But the current direction reverses.By flemming's right hand rule current flow from B to A ,D to C.
This is the working principle of any generator,but from step-1 & step-2 we can observe that,current getting reversed that we don't want in DC generator to eliminate alternating current we use commutator.Commutator is an arrangement which converts AC to DC, in this way DC generator works produces DC voltages.In practical DC generator there will no.of conducts and poles[magnets] to produce required amount of EMF. 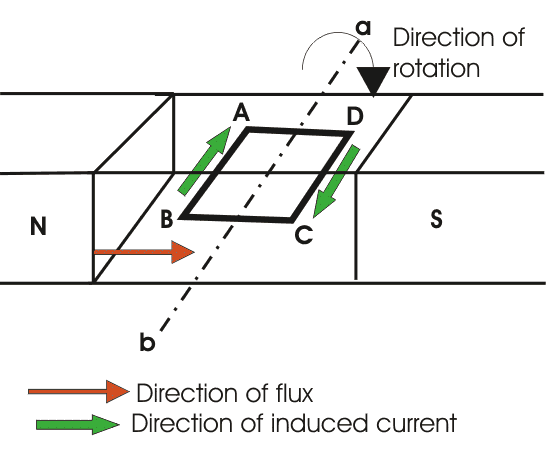 After completion of half rotation, the direction of current in the particular conductor will be reversed.Hence, the direction of current in every armature conductor will be alternating after a half rotation. 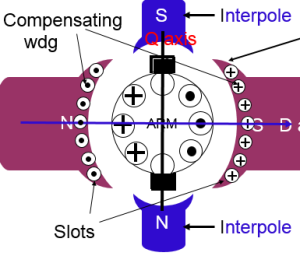 With a split ring commutator, connections of the armature conductors also gets reversed when the current reversal occurs. And therefore, we get unidirectional current at the terminals.